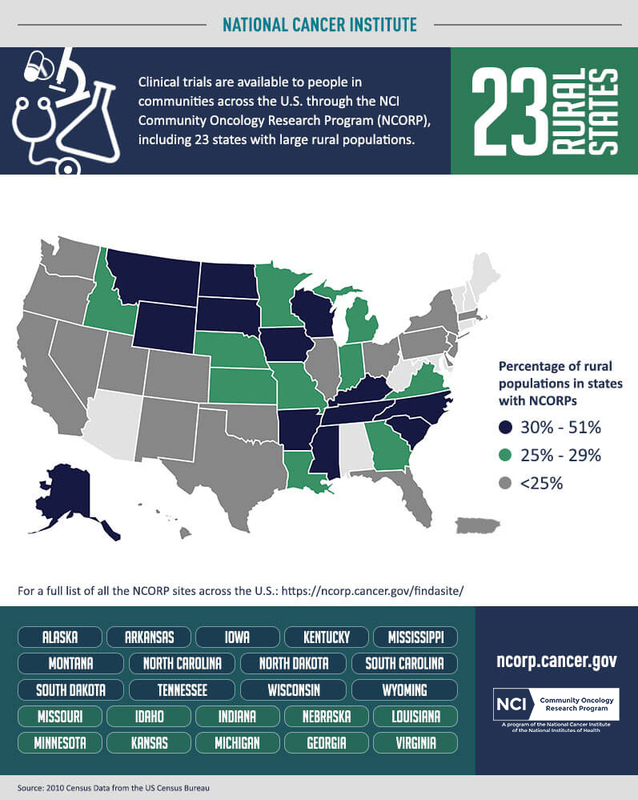 Infographic Description: Clinical Trials are available to people across the U.S. through the NCI Clinical Oncology Research Program (NCORP), including 23 states with large rural populations. Alaska, Arkansas, Iowa, Kentucky, Mississippi, Montana, North Carolina, North Dakota, South Carolina, South Dakota, Tennessee, Wisconsin, and Wyoming. Missouri, Idaho, Indiana, Nebraska, Louisiana, Minnesota, Kansas, Michigan, Georgia, and Virginia. For a full list of all the NCORP sites across the U.S. check out the Find a Site page. Source: 2010 Census Data from the U.S. Census Bureau.